As promised, here is my full review of the new AmaLinks Pro plugin for WordPress. 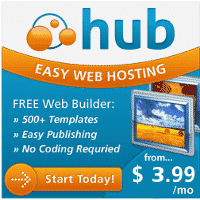 This is a premium plugin created by Matthew Allen and Alchemy Coder (AC). 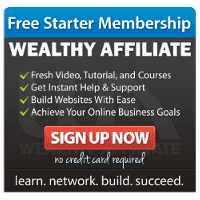 This plugin was created from the ground up to help you bring in more Amazon affiliate income, as quickly and easily as possible. As am Amazon affiliate myself, I can tell you they really hit it out of the park with this one! Special Pricing: April 2nd-April 6th, 2019 ONLY, 50% off Platinum and Premium versions. The plugin makes it so easy to insert a Text Link, Image Link, Call to Action (CTA) link and my favorite, the product Showcase. Here are screenshots showing the simple wizard that guides you through the quick 3 step process. You can then choose if you want to align left, right, center or no alignment. Choose whether you want your link to open in the same windows or a new window. Check to “no-follow” or “follow” the link. And finally, whether you want the item to add to the customer’s cart (90 day cookie) or just take them to the product page (24 hour cookie). I usually choose to not align, open in a new window, “no-follow” the link and take the customer directly to the product page. 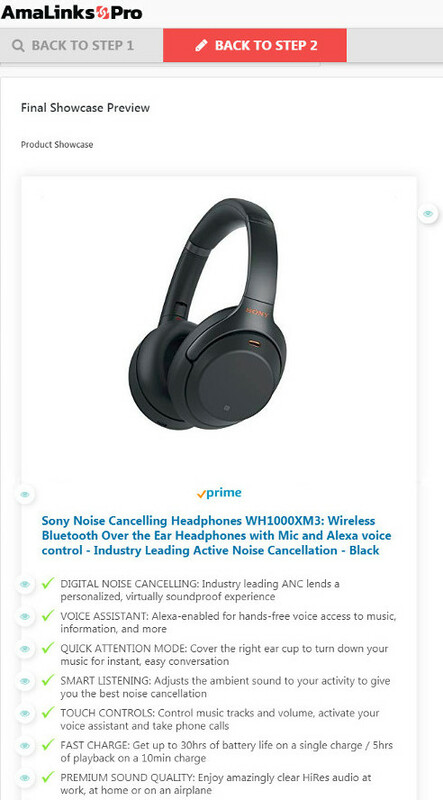 The add-to-cart option adds the item to their Amazon cart and if they purchase that specific item any time within the next 90 days, you would get credit for the commission. Alternatively, if you take the customer directly to the product page, you get a commission for anything the customer purchases within the next 24 hours. That is true regardless of whether they purchase the particular product you are linking to or not. If you click the down arrow next to the reviews, you can scroll through the reviews right there on your site. Try it out. The AmaLinks Pro Table Builder is one of the most requested and highly anticipated features yet and I’m happy to announce it is now available! 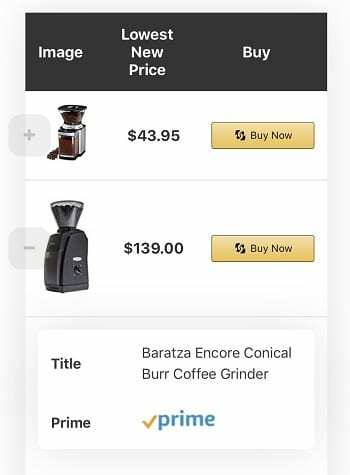 Several members of the Niche Site Tools community have been asking for a way to create responsive Amazon product comparison tables for years. I’m happy to report the long wait is over. There are products out there that can help you create tables for Amazon affiliate products, but they are either insanely difficult to master or they may look decent on a desktop, but everything ends looking terrible on mobile devices. I customized it so that the description and prime fields would not appear automatically on mobile devices. Instead, you would see a + that you can click to expand. The Table Builder is a real game changer and I am excited to be able to bring you these details here today! Is the AmaLinks Pro Plugin in Compliance? 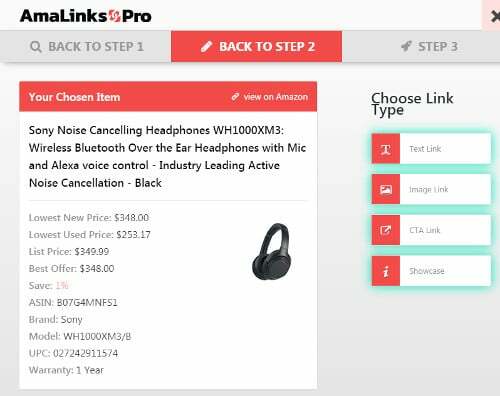 The AmaLinks Pro plugin pulls all of the information from Amazon via the Amazon API. That means that everything pulled via the plugin is in full compliance with Amazon Terms of Service (TOS). That is very important to note, because if you were to try and pull images or information from Amazon product listing or reviews manually, you are breaking Amazon Terms of Service and you could get permanently banned from the Amazon Associates affiliate program. AmaLinks Pro comes in 3 versions. Basic, Premium and Platinum. Basic includes the AmaLinks Pro plugin and gives you full access to everything EXCEPT the Table Builder. Premium includes all the features of AmaLinks Pro AND the Table Builder. This is an annual subscription. If you decide not to continue the annual subscription, everything will continue to work, but you will not be be able to get future updates or create new links/tables. Platinum is basically the Premium version, but for people that would rather pay a higher fee for the product once and not have to pay again. Between April 2nd and April 6th, 2019 ONLY, there is a 50% off special running specifically for NicheSiteTools customers, that applies to the Premium and Platinum versions. After April 6th, the price will be permanently increasing and the discount will no longer be available. I will be updating this post to remove the special pricing after April 6th. 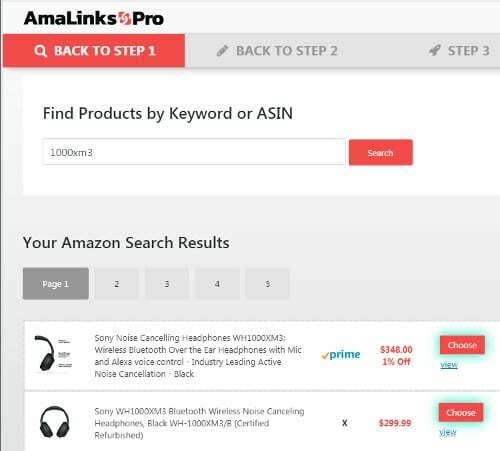 AmaLinks Pro is already better than any existing Amazon Affiliate plugin out there and it comes with a full 30 day, no-questions-asked money back guarantee. If you are interested in building an online business, writing product reviews to receive an affiliate commission, the Amazon Associates affiliate program is one of the best ways to get started. Customers already know like and trust Amazon and if they’re like me, they prefer to purchase items via Amazon Prime first and foremost, when it comes to making an online purchase. AmaLinks Pro is the best WordPress plugin available to help you increase your Amazon Associates affiliate income. I personally switched over all my sites to utilize AmaLinks Pro and am really loving it. As always, if you have any questions at all, feel free to drop a comment below or email me via my contact page. Thanks and I hope you really enjoy this new plugin as much as I have!